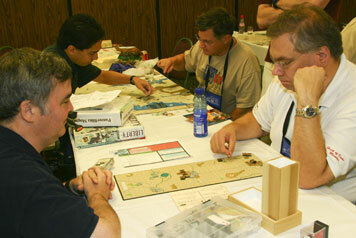 Defending champ Greg Tanner tackles John Sharp (right). The VIP GM should have stayed at sea. He was less prepared for panzers on the steppes than subs at sea. Gordon Stewart (left) goes up against the Bert Schoose steam roller. Bert rolled all the way through the Final to his first WBC championship. The classic eastern front tactical level game saw lots of play in the Grognard precon as well as in the full blown convention. This event, while still quite popular among many of the wargamers, does not seem to generate the intense scoreboard watching and jockeying for positions that several of the other Grognard games seem to do. In any case, the players remain quite passionate about competing well and having fun as they engage in a variety of scenarios. Among the highlights was a three-board match with lots of units that lasted eight hours. On the other side of the spectrum, the legendary grognard himself, Bruno Sinigaglio played a match in which each side was allowed only six minutes per turn since each PanzerBlitz turn is representative of six minutes of real-time action. Once the semi-finals were set, we saw the same four players return to the single elimination phase that had been there in 2006. The Friday night matchups were different this time as Rick Northey earned the #1 seed and was paired off with Bert Schoose. Last year's finalists, defending champ Greg Tanner and Marty Musella were matched in the second semi-final. Both played scenario # 45. To avoid the problem of having to deal with an outcome that ended in a draw, the participants agreed that one player would automatically win the draw while the other player could choose the side that they would play. In Rick and Bert's match, Rick chose to win the draw and Bert then selected to play the Germans. Marty had the choice in the other match and he also chose to win the draw leaving Greg to select the Germans, too. For those who are not familiar with this scenario, it represents a surprise Russian attack in 1944 against a fairly strong German position. Using only board 3, the Russian player starts in Grabyosh and the nearby woods, he moves north and attempts to surround the city of Opustoschenia, trapping and killing as many German units as he can find in that city. At the start of the scenario, ten German units are in the city. Next, he needs to head further north and get across the gully, usually through a single hex chokepoint at 3Z9, since vehicle units are not permitted to enter the gully during this scenario. The German player, who starts with some heavy firepower in the trapped city can usually shoot a hole through the Russian trap and get two units out of the city to safety before his big guns are silenced. He attempts to hold the chokepoint as long as possible, picking off Russians with a goal of killing eight units to achieve the tactical victory level. Surprisingly, based on the play of this scenario in the preliminaries, the German player won both semi-final matches outright without the need for the tie-breaker. Rick's Russians killed all of the big gun targets in the central city on his first attempt (4-1 +1 attacks) but he lost five units in the process, including his infantry killing SU153's. As he maneuvered to the gully, Bert's Germans were able to pick off several more Russian attackers while he held the chokepoint hex through the end of the scenario. In the end, Rick was a unit short of the marginal level while Bert had achieved a tactical victory level to advance. Greg won the rematch of last year's finalists as he was able to have his Hummel unit survive the initial volley and then last throughout the scenario to wreak havoc on Marty's Russian advance. In the end, Greg returned to the Final by reaching the decisive victory level. The two finalists both agreed that it would be better to have the Final match played late Friday night instead of Saturday morning since the players wanted to avoid conflicts with other events they had scheduled for Saturday. Again, they agreed to play # 45. This was a rematch of a preliminary game, won by Greg, using this same scenario. 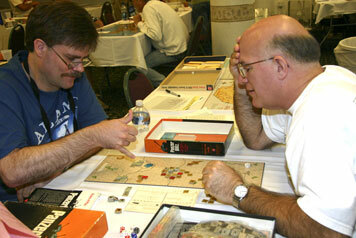 Given the choice, Greg took the Germans and deferred the possible draw outcome to Bert's Russians. While commenting that Bert's initial assault was strong versus the center city, Greg still easily shot a hole through the blocking units to allow a halftrack and passenger to escape and run past the chokepoint. Bert had kept two infantry units loaded so that they could assault the gully or chokepoint as needed. This left the units surrounding Opustoschenia more vulnerable than in the other matches that had used this scenario. Greg missed kills on several overrun attacks on the first turn, settling for dispersals, which would turn out to be critical. The Russian attacks were not too good either as two city hexes survived the (4-1 +1) opening attacks. Fortunately for the Russian, the follow-up CAT attacks (2-1 -1) resulted in a kill and a dispersal. That dispersed hex, with a silenced Wespe was able to survive two more turns of (4-1 +1) attacks before finally succumbing to a CAT attack on Turn 4. Despite surviving three different direct fire attempts, the Wespe never did get another shot off and was not able to add to the German kill total due to the Russian guards keeping that unit pinned down with CAT attacks. Bert broke through the chokepoint by firing his SU153's at the blocking infantry units. Further, he dropped his two loaded infantry units adjacent to the eastern portion of the gully so that they could try to march into the gully to expose the weak German guns. Greg fired off 1-1 attacks versus each unit in am attempt to thwart this plan but it resulted in only one of the infantry units being dispersed. On the second to last turn, Greg abandoned the chokepoint hex and allowed the Russian tanks to pour through in an attempt to surround, expose and then shoot the German units. Most of Greg's infantry were located in the city of Zabvenia while the guns were in the woods hexes in the center and east. Bert chose to ignore the city for fear that Greg might get some kills on adjacent tanks with CAT attacks. The Russian death total stood at six units and the German needed two more to elevate his side to the Tactical victory level. He combined his DF forces to secure one automatic kill but needed to add one more killed unit and some missed shots by the Russian on the last turn. The best that Greg came up with was a CAT attack (1-2 -2) that had a 1 in 6 chance of getting the first part of that job done. It did not happen. As it turned out, Bert did manage to miss two more (4-1 +1) attacks on his final turn which left both players at only the marginal victory level. Greg's own poor shooting on his initial overrun attacks left him just short of taking full advantage of the poor shooting by his opponent. Based on the initial side selection, Bert Schoose won the draw and his first ever WBC first place finish. It wouldn't be his last in this WBC.